The section of a handrail that changes direction. Usually in a smooth curve. 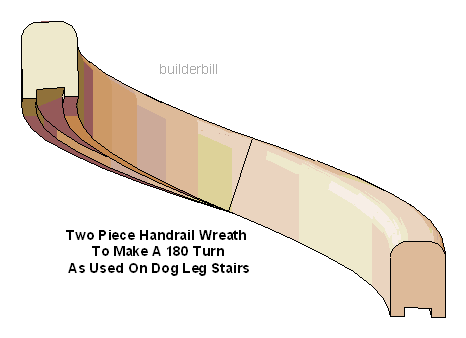 A 180 turn, hand carved wreath to a dog leg stair. 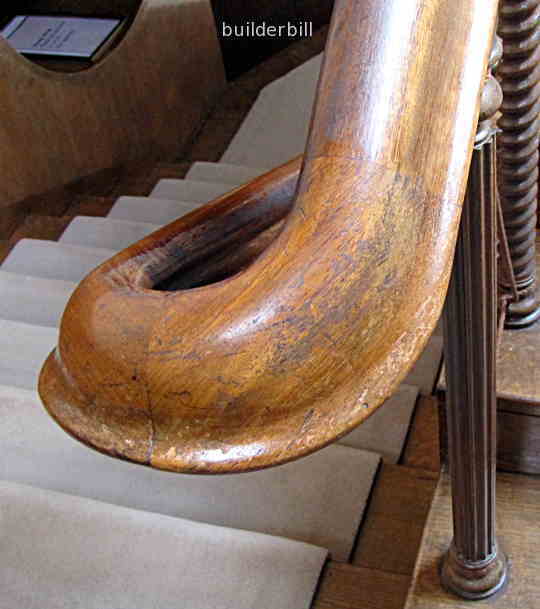 What you see above is a wooden handrail that a hand can slide along smoothly from one flight to the other without losing or changing the grip. This is the ideal situation. In the sketch above we see a solid timber quarter turn for a level handrail. It is a boxy shape and has a groove underneath for easy location of the balusters. It is made out of a quite large piece of timber, sawn on a band saw and the rest can easily be done with a router or spindle moulder. When the handrail takes a sloping turn, as at a quarter space landing then we get a whole new ball game. A twist has to be inserted. 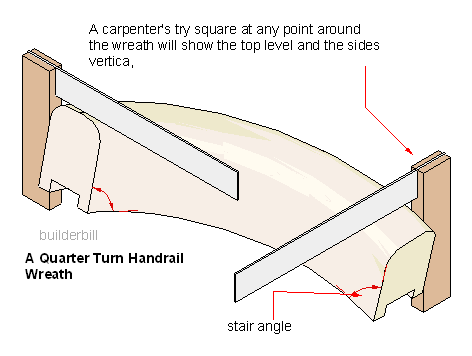 The convention for all handrail turns is that at any point of the curve and at a tangent to it the sides will be vertical and the top will be level. Most handrails even though they may have no flats on them at all, they may be oval shaped but the section through a handrail at any point be it taken on a level or sloping part or at a curved part is always the same. So almost all wreaths have the shaped twist except the one popular exception. This is of course a circular pipe handrail. See below. Here is another sketch of a 180 degree scroll made up of two sections. 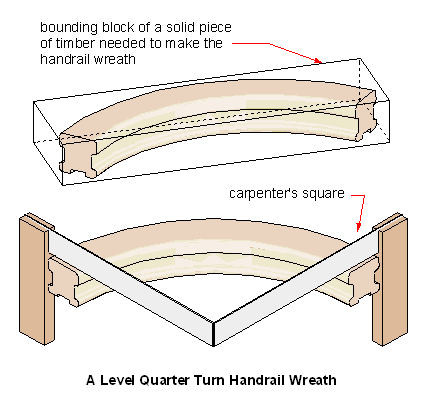 Handrail wreaths have been for centuries just about the ultimate in hand joinery, but there would be very few made today using the old methods of setting out the shape in a solid block of timber and then shaping it with hand tools. Most small joinery shops today take advantage of modern glues and work quite efficiently using various jigs and formers and laminate thin strips of timber to build up the wreathes and then they finish them off with hand held power tools. Larger specialist companies use highly sophisticated CNC router machines to form the handrail wreaths complete. They shape it precisely and then even drill the holes for the dowels and the handrail bolts. Anything and everything is possible with modern CNC router machine. 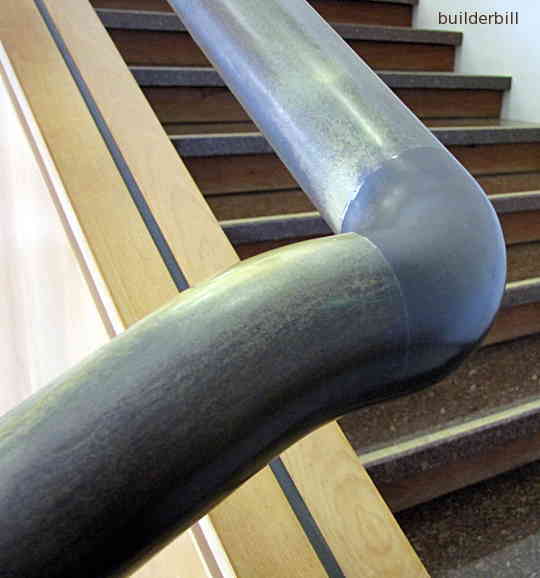 A pipe handrail using standard pipe bending techniques and standard pipe elbows. Simple to use and set out. Standard pipe fitting can be used, or as in this case a pipe bender and a 90deg. elbow. The elbows come in a couple of sizes, a tight bend like shown here and long bends. It is simply a matter of cutting the bends at the right position and angle to form different angles.